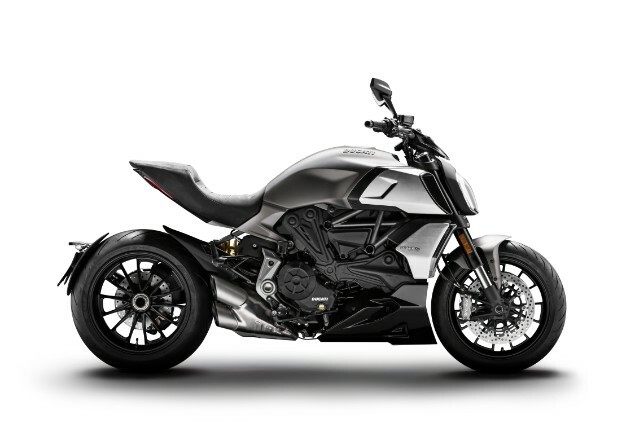 Ducati has given the performance cruiser Diavel 1260 range a complete makeover for 2019 with the some of the biggest revisions to the bike since it was launched in 2010. The Diavel was a huge step for Ducati to make when it entered the cruiser market in the hope of taking some of the huge global sales for this style of bike. As before, the Diavel range has the standard bike and an ‘S’ model which has higher-specification components and a higher price tag. When it was launched, Ducati was at great pains to point out the Diavel was in essence a cruiser but would still have to handle, go and stop with a level of performance associated with the Italian firm’s history. 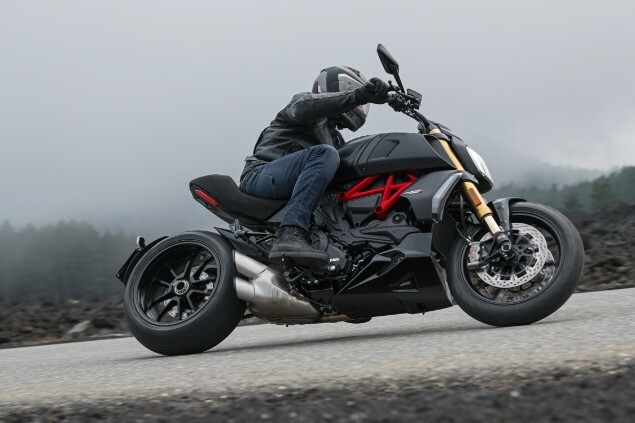 Since the launch of the Diavel, Ducati added the XDiavel model which added an optional feet forward riding position to make it even more tuned for the cruiser market. This second-generation Diavel’s biggest change is the fitment of the latest 1262cc, V-twin motor that was first used in the Multistrada 1260 and also the XDiavel. This engine has the same Desmodromic Variable Timing (DVT) which is the Ducati name for variable valve timing and works to smooth out the torque delivery and boost top end power which has now been lifted to 159hp at 9500rpm. The variable valve timing works continuously on the intake and exhaust camshafts to adjust the engine power delivery to suit different riding conditions, staying smooth at low revs and adding a more sporty touch to the top end. A new design of tubular steel trellis chassis has been developed for the 2019 range with Ducati stating the aim was to make the handling even more ‘sporty’ than before. The steel trellis frame still uses the V-twin engine as a stressed member and is attached to the frame at the two cylinderheads; as is the cast aluminium subframe. The cast aluminium swingarm remains; as does the massive 240-section rear tyre which has always been a defining element of the Diavel. On the standard Diavel 50mm diameter front suspension is fully adjustable for compression, rebound and preload, as is the shock. On the Diavel 1260 S model there is a set of 48mm Ohlins forks and shock; all fully adjustable. Another area of difference between the standard bike and the ‘S’ model is the front brakes with the standard bike using Brembo M4.32 radially-mounted monobloc calipers while the ‘S’ has higher-spec M50 calipers. Both Diavels available have the Thin Film Transistor (TFT) dashboard which is full colour and works with a separate warning light module. 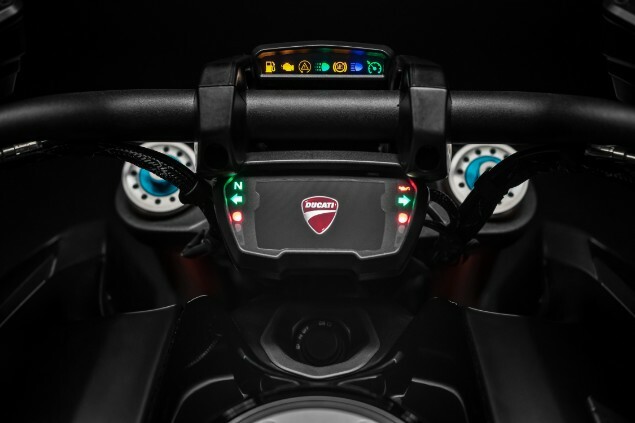 There are four different display modes with a Default mode that shows a minimal level of must-know information and there are also Track, City and Full modes which work with the chosen riding mode. 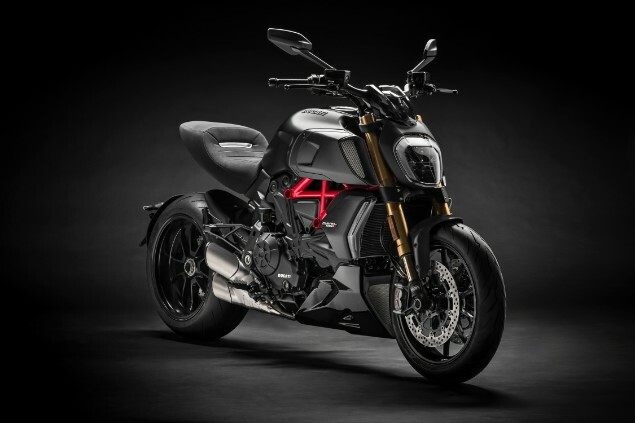 The ‘S’ model also feature the Ducati Multimedia System (DMS) which uses Bluetooth to link a smartphone to the bike to take incoming phonecalls and other messages. Front and rear lights are full LED, the bike has a keyless ignition system, multiple riding modes and the very latest in rider safety aids including cornering ABS, traction control, anti-wheelie and launch control.